THE AFFORDABLE TOOL IS DESIGNED TO DELIVER VOLUME AND SHINE IN ONE FELL SWOOP. BOSSRED BY IONIC TECHNOLOGY™, HAIR DRIES FASTER WITH LESS HEAT-RELATED DAMAGE AND IT SOUNDS LIKE THE PERFECT TIME-SAVER FOR THE TIME-SHORT. IT DRIES YOUR HAIR, BOOSTS VOLUME, AND LEAVES YOUR STRANDS SUPER SHINY. Hot-air brushes are fast becoming the hair tools of the moment because they are great for all hair types, and some even double as hair straighteners and curling irons. Hot air brushes are used for straightening, curling, waving and adding volume, and they are also considered to be safer than curling tongs because they don’t hold hair between heated plates but style it by blowing hot air. They’ve particularly piqued women’s interest due to their potential to streamline their hair care routine and reduce the amount of heat they expose their hair to on a weekly basis. The Revlon One-Step Hair Dryer and Volumizer could be just what women have been looking for. This multitasking tool claims to provide volume and shine in one go. Combine the power of a hair dryer and the performance of a styler, and throw in a whopping 1100 watts for that gorgeous volume and brilliant shine in a single step — exactly what this 2-in-1 styling tool from Revlon does. Unlike many other similar gadgets currently on the market, this option focuses more on shape than on smoothness thanks to its oval brush head and duo of different bristle types. This two-in-one tool combines the power of a dryer and the volume of a styler for a quick, easy blowout you can do yourself. Other features include ionic technology that transfers airflow instantly to your hair and helps to condition, smooth and make hair shinier for a sleeker finish, and the Professional Swivel cord that allows for easier styling, letting you customise your style. There is also two temperature settings to suit both fine and thick hair types and ceramic coating for even heat distribution. There are also Nylon pin bristles with comfortable ball tips that help to dry and style your hair simultaneously, reducing fizz and knots. The handle of the brush is an ergonomic design, which reduces time spent drying, curling and styling your hair, so it’ll keep your shoulders and upper back from hurting after prolonged use. This will also keep your hand from becoming cramped. The One Step Hair Dryer & Volumizer is pretty big – somewhere between a microphone and a boom operator, which will actually prove to be a welcome attribute for reaching the back of your head later on. It is quite loud but no louder than a standard hairdryer. Also, thanks to the clear instructions in the enclosed booklet, this tool is simple to use. Many women who use hot-air brushes know that you have to brace yourself for a lot of pulling and tugging when using these tools. However, the Revlon One-Step Hair Dryer and Volumizer has combination of harder and tufted natural bristles, which allow the brush to move smoothly through your hair from root to tip. It’s important to note that its head doesn’t rotate. However, many women say that this fact makes the process a lot simpler because they don’t have to worry about pressing the correct rotator button. Many women also say that they love the fact that this tool has oval head, because this allows them to get in closer to the roots and create more volume with greater ease. Holding the brush underneath each section for the recommended 2-3 seconds and then rolling it outwards towards the ends will give natural looking yet noticeable body to each section of your hair. It’s important to note that this gadget is also quick, with around three to four swipes needed to get each one dry. Removing the need to go in with a straightener afterwards to fine-tune your handiwork, providing great volume at the roots, smoothness through the lengths and movement at the ends, this amazing brush delivered on all fronts. Other brushes on the market require you to dry the hair to approximately 80% dry. However, this brush is more like a hair dryer, which truly keeps you from having to purchase a separate hair dryer. The Revlon One-Step Hair Dryer and Volumiser has a higher wattage as compared to other brands, but the hot air brush won’t burn scalp and will. In fact, give an extra oomph to the roots plus a full body and curled ends – we’re talking about bouncy voluminous curls here! 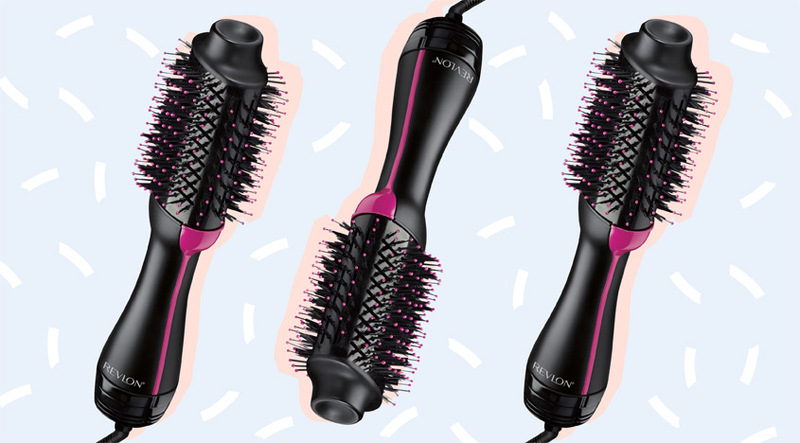 This brush can be used for nights out as a cheaper and quicker alternative to an in-salon blowdry. It will leave your hair shiny and bouncy and help you shave some much-appreciated minutes off your styling time. It will provide smooth volumizing hair styled as if you’d gone to the salon for a blow out.